Hit your opponents with pies before they hit you. 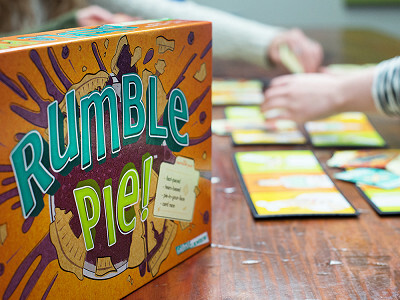 That’s the goal of Rumble Pie, a fast-paced, pie-in-your-face game that, fortunately, is messy only in the figurative sense. In this card race, everyone plays at once, throwing and dodging pies at the same time. It’s a hectic free-for-all as each player tries to score the most hits. Numbered cards, played in order, let you pick up, wind up, and throw a pie. Then, play a “Kapow” card to land one right in the kisser. But Rumble Pie isn’t just a game of offense. Quick reflexes are essential, because opponents can stop your pie flinging mid-throw. And you need to block any pies being hurled your way. 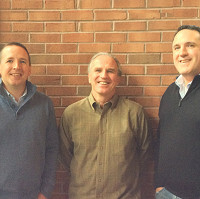 John Blaine and his sons Seth and Brycen created Rumble Pie through their New Hampshire-based company, Goldbrick Games. They thought a quick action game of pie wars would appeal to all ages. After playing a few frantic, fun-filled rounds, you'll agree that they hit the mark. Hi -- I'm John, and happy to share with you our blazingly fast, incredibly fun card game that keeps everyone in the middle of the action from start to finish. Players slap down cards quickly to build pies, land a pie, earn points, and kapow! Let me know if you have questions. Hi, John. I have a family that spans a wide age range and I'm looking for games that we can all play together. Finding a game that is age appropriate yet also entertaining for various ages is tougher than I thought! Do you consider Rumble Pie a game that can span a wide age range? Hi Autumn. Thanks for your question. Rumble Pie is a great game for a wide age range (Ages 8+). It's fast, and everybody plays at once, so nobody is waiting for their turn to come up. This appeals to all ages. Also, Rumble Pie is really fun when played in teams, which gives an opportunity to "level the playing field" and adjust for skills and age. And last, like all card-based games, there's a luck-of-the-draw element that keeps everyone in the mix. I think you'll find that, after a couple of rounds, the adults will be challenged to keep up with the kids. Hit your opponents with pies before they hit you. 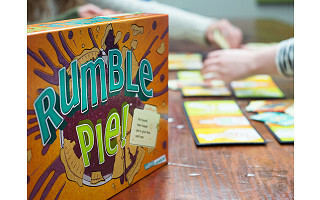 That’s the goal of Rumble Pie, a fast-paced, pie-in-your-face game that, fortunately, is messy only in the figurative sense. In this card race, everyone plays at once, throwing and dodging pies at the same time. It’s a hectic free-for-all as each player tries to score the most hits. Numbered cards, played in order, let you pick up, wind up, and throw a pie. Then, play a “Kapow” card to land one right in the kisser. But Rumble Pie isn’t just a game of offense. Quick reflexes are essential, because opponents can stop your pie flinging mid-throw. And you need to block any pies being hurled your way.